RotoRacer RR210 is a light weight mini quad frame designed for 5 inch propellers and FPV racing. In this post Artur will show us the frame, how he built it and what he think of this quadcopter frame. Get your RR210 mini quad frame from RotoRacer. Frame comes in a very nice package. Total weight of the fully assembled frame is 102g. Diagonal motor to motor distance is 210mm. This is an X frame and the width and length of this frame is exactly the same (the four motors form a square). This is unlike the Speed Addict 210 or DemonRC Nox5 we reviewed recently where width is always longer then the length of the frame, but that is for a good reason relates to weight distribution and flight characteristics, we will see how the RR210 plays out. Arms have the same mounting holes location as ZMR250 arms and frame is actually fully compatible with those ZMR250 arms, although I haven’t tried it myself to verify that. RR210 arms have some different design and they are narrower towards the motor mounts. I reckon this can be potentially a weak spot for the arm strength. The design of the bottom and top plates are not symmetrical. They have multiple cutouts for lipo straps, video antenna, power cable and FPV camera . It is a low profile frame with only 30mm between the top and the bottom plates. There are threaded metal rings incorporated into the carbon fibre middle plate, they are “glued on” and cannot be turned, so you won’t need a pair of pliers to hold them. I find it easier to work with than the traditional nylon nuts. Arms can be easily removed in the field for instance if they need to be changed. The carbon fibre quality is great and frame parts fit together nicely. The frame feels pretty rigid once assembled, but there is just a little flex on the arms (similar to flex on Alien frame). Mini Power Distribution Board (optional) that came with the reviewed frame is a very basic and very tiny. It can fit right into the middle plate cut out, and it just stays there by pushing it down without any additional support. It has two voltage regulators – 5V and 12V. I checked with a multimeter, both regulators output voltages are correct. On the bottom of the PDB there is a very bright blue LED. With the PDB installed in the frame, the LED light can be seen through the gap from behind if you are flying forward. It was my first build where I used KISS FC with non-KISS ESC’s. Fitting Radio Receiver and video gear wasn’t the easiest job on this compact frame. At first I tried to fit the X4R-SB RX under the top plate but it was too big with the pins and there was not much room left for VTX. In the end I had to de-pin the D4R-II RX and leave it on the bottom plate, near Flight Controller. If you want to run SBUS I strongly recommend using this miniature size XSR RX instead, it’s the same RX as the X4R-SB just smaller. What we would expect from the compact racing frame is the low weight. Pretty light weight I would say. Note that only small 1300-1500 lipos can be used on this frame, any long lipo would stick out at the back. It’s a very compact frame and probably more suitable for experienced builders. Very bright blue LED on the bottom of the PDB, it’s visible by other pilots from behind while racing, very cool feature! Props are very tight towards the main body. Loose antenna, wires, zip ties etc. can easily get sucked in and chopped off. Regarding lipos: “It is possible to use even bigger lipos than 1300-1500 if they are attached to underside of the quad or still on the top but without the HD camera”. Mac also confirmed the strength of the arms: “After months of testing, the only place where arms where cracking after a bad crash was the location near the fuselage and not near the motors”. He explained the receiver antenna location on the top plate: “Two small cutouts near the second row of standoffs are designed to hold the receiver antenna”. In my review I used a different location, more convenient for me with Gopro attached to the top plate. 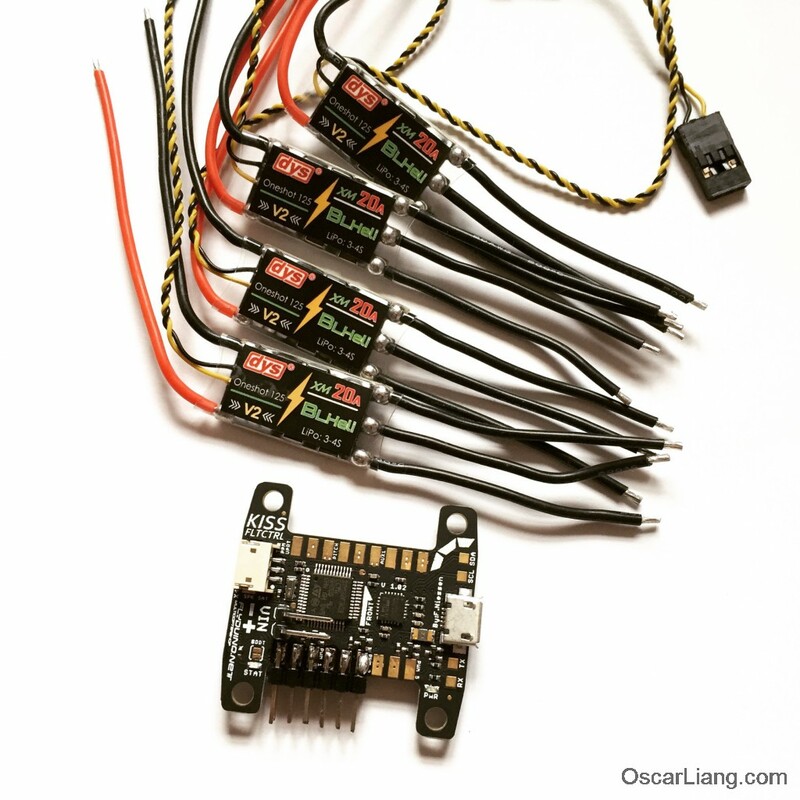 Bio: A mini quad pilot based in Scotland, Co-Admin of Multicopter International FB Group.